This course is for Track Experience riders who have at least 3 recent Track Experience days under their belt and for all riders with a racing license or who have completed the Basic Course. Note: On Penguin Fridays riders are separated by experience in open sessions later in the day. You don't need to be an "advanced" rider to attend - our aim is to simply bring you closer to this goal! If you are looking to make yourself a better rider and want to attend one of the most acclaimed training classes in the country, you should attend the Advanced Course with LRRS champion and AMA race winner Eric Wood. We will lower your lap times!! All of our advanced coaches are expert class champions who can help you with bike setup, starts, braking, cornering, race lines, and more! If you have questions, we will have answers. 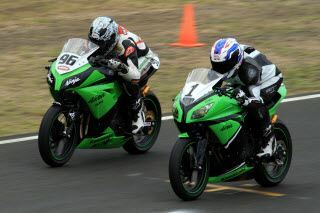 The advanced course includes classroom, detailed track walk, guided riding time, open practice, and individual tutoring. At many events we are able to do individual student critique not only via track-side observation, but also through photographic and video analysis. We always have instructors available in the afternoon who can ride 1 on 1 with students looking for some extra help. Save $$ with a Learn to Fly membership. Testimonial: "I attended the Penguin Advanced School last week (I'm an Amateur on a GSXR600). On the race weekend after the class I went a 1:23....5 seconds faster than my previous weekend! I just wanted you to know that your teaching was VERY effective for me. Thanks again!" - D.L. Must either hold valid race license or have completed the Basic course within the last 12 mos.